Received August 23, 2018; Revised August 31, 2018; Accepted October 10, 2018. The areas of soybean (Glycine max (L.) Merrill) cultivation in Gangwon-do have increased due to the growing demand for well-being foods. The soybean barcode system is a useful tool for cultivar identification and diversity analysis, which could be used in the seed production system for soybean cultivars. We genotyped cultivars using 202 insertion and deletion (InDel) markers specific to dense variation blocks (dVBs), and examined their ability to identify cultivars and analyze diversity by comparison to the database in the soybean barcode system. The genetic homology of “Cheonga,” “Gichan,” “Daewang,” “Haesal,” and “Gangil” to the 147 accessions was lower than 81.2%, demonstrating that these barcodes have potentiality in cultivar identification. Diversity analysis of one hundred and fifty-three soybean cultivars revealed four subgroups and one admixture (major allele frequency <0.6). Among the accessions, “Heugcheong,” “Hoban,” and “Cheonga” were included in subgroup 1 and “Gichan,” “Daewang,” “Haesal,” and “Gangil” in the admixture. The genetic regions of subgroups 3 and 4 in the admixture were reshuffled for early maturity and environmental tolerance, respectively, suggesting that soybean accessions with new dVB types should be developed to improve the value of soybean products to the end user. These results indicated that the two-dimensional barcodes of soybean cultivars enable not only genetic identification, but also management of genetic resources through diversity analysis. 콩은 전세계 주요 작물 중의 하나로, 국내에서는 170개 품종이 등록되어 있으며 장류 및 두부콩류, 밥밑용, 풋콩 및 올콩류 등으로 다양하게 이용되고 있다(Lee et al. 2015, http://www.seed.go.kr/). 최근 웰빙 건강식품에 대한 수요가 증가하면서 청정지역인 강원도에서 생산된 콩의 기능성과 지역 적응성이 우수한 품종에 대한 관심이 높아지고 있다. 강원도에서는 1999년 기능성 콩인 ‘흑청’을 시작으로 ‘호반’, ‘청아’, ‘대왕’, ‘강일’, ‘햇살’, ‘기찬’ 품종이 육성되었다(Choi et al. 2011, Ha et al. 2002, Ha et al. 2013a, Ha et al. 2013b, http://www.seed.go.kr/). 강원도 개발 콩 품종 수의 증가에 맞춘 종자보급체계 구축이 필요한데 이를 위한 품종 판별은 각 품종의 균일성과 안정성을 유지하기 위해 반드시 필요하다. 또한 국제식물신품종보호연맹(UPOV) 가입(http://www.seed.go.kr/)과 콩의 원산지 허위 표시(http://www.naqs.go.kr/) 등 국내외 환경변화에 따라 국내 육성 품종을 보호하기 위해서는 품종 판별에 대한 연구가 선행되어야 한다. 작물의 품종 판별은 초형, 잎 모양, 종실 크기 등을 이용한 형태적 분류가 주로 이용된다. 농업형질은 환경 변화에 영향을 받을 뿐만 아니라 육종가의 전문성과 경험에 따라 품종 판별 결과는 달라질 수 있다(Agarwal et al. 2008, Inger & Rodomiro 2000, Korir et al. 2013). 이러한 문제점을 보완하고자 DNA 분자마커에 대한 연구가 활발히 진행되고 있으며, 최근 유전체 해독 기술의 급속한 발전으로 분자마커의 탐색이 예전에 비해 보다 쉬워졌다(Agarwal et al. 2008, Deschamps & Campbell 2010, Ganal et al. 2009, Hyten et al. 2010, Inger & Rodomiro 2000, Korir et al. 2013). 그 종류로는 AFLP (Amplified Fragment Length Polymorphism), RFLPs (Restriction Fragment Length Polymorphism), RAPD (Random Amplified Polymorphic DNA), SSRs (Simple Sequence Repeats, microsatellite), STS (Simple Tagged Sites), CAPS (Cleaved Amplication Polymorphic Sequence), InDel (Insertion and Deletion) 등이 있다(Ganal et al. 2009, Deschamps & Campbell 2010, Hwang et al. 2009, Hyten et al. 2010, Kim et al. 2006, Kim & Misra 2007, Kim et al. 2010, Kim et al. 2012, Liu et al. 2012, Li et al. 2014, Moghaddam et al. 2014, Song et al. 2010). 이중 InDel 마커는 공우성(co-dominant)이며 재현성이 높아 실험실 수준에서 쉽게 품종을 판별하고 유전자원을 평가하는데 효율적이다(Hou et al. 2010, Li et al. 2014, Montgomery et al. 2013, Mullaney et al. 2010, Pacurar et al. 2012, Song et al. 2015, Yamaki et al. 2013). Kim et al. (2014)은 6개 콩의 전장유전체를 분석하여 단일염기 다형성(Single Nucleotide polymorphism, SNP)이 축적된 밀집변이영역(dense variation blocks, dVB)과 변이가 거의 없는 공통영역(sparse variation block)으로 유전체를 구분하였다. dVB는 품종 고유의 특성을 잘 나타내고 있기 때문에 품종 간 뚜렷한 차이가 있는 dVB 특이적인 202개 InDel 마커를 선발하여 콩 품종 인식 시스템을 개발하였다. 이를 이용하면 국내에서 육성된 147개 품종을 구분할 수 있으며 추가적인 마커 개발없이 기존 마커로 신품종의 판별이 가능하다(Sohn et al. 2017a). 또한 202개 InDel 마커는 지금까지 우리나라 콩 품종의 유전적 다양성 분석과 함께 염색체 재조합 양상을 쉽게 구명할 수 있어 새로운 유전자원의 발굴, 교배 조합의 예측 등에 활용할 수 있어 품종 육종 효율을 높일 수 있다(Sohn et al. 2017b). 본 연구에서는 dVB 특이적인 202개 InDel 마커를 강원도 콩 품종에 적용하여 기존의 147 품종과 명확하게 구분되는 바코드 데이터베이스를 구축하였다. 또한, 집단구조 및 계통유연관계를 분석하여 강원도 콩 품종이 시대의 변화에 따라 어떻게 변화해 왔는지를 염색체 수준에서 구명하였다. 따라서, 사용자 친화적인 콩 품종 인식 바코드 시스템의 활용으로 강원도 육성 콩 품종의 지식재산권 보호 및 브랜드화로 강원도 콩 산업의 경쟁력을 제고할 수 있을 것으로 기대된다. 강원도에서 육성된 7개 품종을 공시재료로 사용하였다(Table 1). 이중 ‘흑청’, ‘호반’의 경우 Sohn et al. (2017b)이 보고한 유전형 결과를 이용하였다. ‘청아’, ‘대왕’, ‘햇살’, ‘강일’, ‘기찬’의 경우 각 품종당 15일된 어린잎을 10주씩 혼합(Reyes-Valdes et al. 2013, Sham et al. 2002) 채취하여 Rogers & Dendich (1994)가 제시한 CTAB (cetyltrimethyl ammonium bromide) 방법에 따라 DNA를 추출하였다. 분광광도계(NanoDrop2000, Thermo Scientific, USA)를 이용하여 각 품종의 DNA 농도를 20 ng/μL로 조정하였다. List of soybean cultivars bred in Gangwon province. 기존에 선발된 202개 InDel 마커(Sohn et al. 2017a)를 이용하여 Sohn et al. (2017b)이 제시한 방법에 따라 PCR 및 전기 영동을 수행하였다. DNA 20 ng, 2pmol primer (Bioneer, Korea), 2X DNA free-Taq multiplex PCR Mastermix (CellSafe, Korea)를 첨가하여 PCR 반응액의 총 부피를 8μL로 맞추었다. PCR은 95°C에서 5분 동안 초기변성하고, 변성(95°C, 30초), 결합(45°C, 30초), 신장(72°C, 30초) 단계를 35회 반복하였으며 72°C에서 5분 간 최종 신장하였다. PCR 산물은 3% agarose gel에서 전기영동 한 후 밴드를 확인하였다. ‘Williams 82’와 같은 밴드크기를 보이는 PCR 결과는 ‘a’, 다른 결과는 ‘b’로 전환하여 2차원 바코드로 표기하였다(Sohn et al. 2017a). 마커 증폭 결과가 두 타입(모본, 부본) 모두 나오는 헤테로(hetero)의 경우 노란 블록으로 나타냈으며 유사도 분석에서 제외하였다. 본 연구에서는 Sohn et al. (2017b)이 보고한 품종에 강원도에서 육성된 콩을 추가하여 153 품종(Table 2)의 유전형을 이용하여 집단구조 및 계통유연관계를 분석하였다. PCR 증폭 결과가 ‘a’인 경우를 ‘0’으로 전환하여 표기하고, ‘b’인 경우 ‘1’로 전환하여 디지털화하였다. Model-based program인 STRUCTURE 2.2.3을 이용하여 집단구조 분석을 수행하였다(Pritchard et al. 2000). 100,000의 burn-in, 100,000의 run length로 LnP(D)를 계산하여 결정계수(ad hoc criterion, △K)를 구하여 적정 조상군(subgroup) 수를 결정하였다(Evanno et al. 2005). DARwin 프로그램을 이용하여 weighted neighbor-joining tree를 작성하였다(Perrier & Jacquemoud 2006). Lee et al. (2015)이 보고한 해당 품종의 교배모부본을 참고하여 계보도를 작성하였다. List of soybean cultivars used in this study. 강원도에서 육성된 콩은 대립종이며 제색이 황색으로, 콩의 품위가 우수한 품종에 조숙성, 내도복, 다수성인 특성을 지속적으로 도입하였다(Choi et al. 2011, Ha et al. 2013a, Ha et al. 2013b). 지금까지 ‘청아’, ‘대왕’, ‘햇살’, ‘강일’, ‘기찬’ 등을 육성하였다(Fig. 1A). 그러나 강원도 육성 품종은 보급종인 ‘대원’, ‘태광’과 종자 특성이 유사하여 육안으로 구분하는 것이 어렵다. 이를 보완하기 위해서 콩 품종인식 바코드 시스템의 dVB 특이적인 202개 InDel 마커를 이용하여 강원도 육성 품종을 구분하였다(Kim et al. 2014, Sohn et al. 2017a). Application of soybean barcode system to soybean cultivars bred in Gangwon-do. (A) Seed morphology of five soybean cultivars including ‘Cheonga’, ‘Gichan’, ‘Daewang’, ‘Haesal’ and ‘Gangil’. (B) Bar-coding representation of the polymorphisms revealed by 202 InDel markers in the five soybean cultivars. The same result with the genome of reference cultivar, ‘Williams 82’ is represented by “a” (pink), the other by “b” (blue). “h” (yellow) means hetero-type. 202개 InDel 마커를 이용하여 강원도 육성 품종의 유전형을 2차원 바코드로 구축하였으며(Fig. 1B), 콩 품종 인식 시스템의 148 품종과 비교하여 품종 판별력을 분석하였다. ‘청아’, ‘기찬’, ‘햇살’, ‘강일’ 품종의 경우 각각 ‘한올’(72.3%), ‘대왕’(80.7%), ‘기찬’(78.7%), ‘햇살’(71.3%)과 유사하였다. 특히 ‘대왕’(강원91×석량풋콩)의 경우 ‘석량풋콩’과 유전적 유사도가 81.2%로 가장 높았으며 바코드 비교 결과 교배모부본에 관한 정보를 잘 반영하고 있음을 확인할 수 있었다(Fig. 2). 품종의 2차원 바코드를 비교하여 다른 블록을 시각적으로 쉽게 구분할 수 있어 품종의 유전형 차이를 명확하게 판단할 수 있다. Sohn et al. (2017a)은 콩 품종 인식 시스템을 이용하여 여교배 방법으로 육성한 ‘신강’과 반복친으로 사용한 ‘소원콩’을 분석하였으며, 그 결과 98.5%로 유사성이 매우 높게 나타났으나 202개 InDel로 명확하게 구분됨을 확인하였다. 이는 148 품종과 71.3-81.2% 유사성이 있는 강원도 품종의 바코드가 품종 고유의 특성을 잘 나타낸다는 것을 뒷받침한다. The comparison of DNA barcode newly developed in ‘Daewang’ with that of ‘Seokryangputkong’. (A) Seed morphology and (B) A study on the mutual homology of ‘Daewang’ and ‘Seokrayngputkong. The same results were represented by white, the other results by black. Gray means a blank block. ‘청아’[염색체(Chromosome, Chr) 13의 두 영역], ‘기찬’(Chr04, 18의 각 한 영역, Chr07의 두 영역), ‘대왕’(Chr04, 07, 20의 각 한 영역), ‘햇살’(Chr20의 한 영역), ‘강일’(Chr04, 07, 17, 20의 각 한 영역)에서 헤태로(hetero) 블록의 탐색을 통하여 각 품종이 완전히 고정이 안 되었음을 확인할 수 있었다(Fig. 1B). 따라서, 국립식량과학원에서 개발한 품종 인식 바코드 시스템을 이용하여 강원도 육성 품종을 판별하고 고정화 정도를 구명할 수 있기 때문에 종자보급종체계에서 각 품종의 균일성과 안정성을 평가할 수 있다. dVB 특이적인 202개 InDel 마커를 이용하여 153개 품종의 집단구조와 계통유연관계를 분석하였다. 집단구조를 분석하기 위해 STRUCUTURE 프로그램(Pritchard et al. 2000)을 이용하였다. Deviance information criterion (DIC) value는 ΔK가 4일 때 최대값을 보였기 때문에 cluster model로서 K=4를 사용해서 집단을 구분하였다. 그 결과는 Sohn et al. (2017b)이 보고한 내용과 동일하게 국내 품종을 subgroup 1, 2, 3, 4 와 admixture (단일 조상에서 유래된 allele 빈도가 0.6 이하) 유전집단으로 구분하였다(Fig. 3A). 이중 ‘흑청’, ‘호반’, ‘청아’ 품종을 subgroup 1, ‘대왕’, ‘햇살’, ‘강일’, ‘기찬’을 admixture로 분류하였다(Fig. 3B). ‘호반’, ‘청아’ 품종은 장류 및 두부용으로 대립종이며 제색이 황색으로 subgroup 1에 속하는 품종에서 나타나는 전형적인 특성을 나타내고 있다(Figs. 1A, 3A). ‘호반’의 경우 재래종을 순계분리한 GWS 91과 Lipoxygenase 2와 3이 결핍된 ‘진품콩’(subgroup 1)을 교배하여 육성한 품종으로 종실 특성이 우수하고 비린내가 없다(Ha et al. 2013, Sohn et al. 2017b). ‘청아’는 기존 특성에 내재해 다수성 장류용 콩을 육성하기 위하여 subgroup 4의 전형적인 특성을 보이는 ‘신팔달콩 2호’를 모본으로 활용하여 육성되었다(Ha et al. 2013, Sohn et al. 2017b). Diversity analysis of 153 soybean cultivars. (A) STRUCTURE (Pritchard et al. 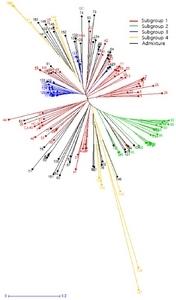 2000) results: 153 soybean cultivars were divided in four subpopulations and one admixture. (B) Diversity analysis of 7 soybean cultivars bred in Gwangwon province. Each color represents a subpopulation based on STRUCTURE results. 최근에 육성된 ‘대왕’, ‘햇살’, ‘강일’, ‘기찬’ 품종은 다양한 유전집단의 유전 영역이 잘 섞인 admixture 형태를 보였다(Fig. 3B). ‘기찬’은 subgroup 1과 4의 유전 영역이 잘 섞여 있다. ‘대왕’은 ‘석량풋콩’(subgroup 3)을 이용하여 종실 특성이 우수한 재래종에서 순계분리한 ‘GWS91호’의 성숙기를 앞당긴 품종이다(Choi et al. 2011). ‘햇살’과 ‘강일’은 subgroup 3과 4의 유전 영역이 섞여 보급종인 ‘태광’에 비해 성숙기가 빠른 조숙성이면서 내재해성 품종이다. 이중 ‘햇살’ 콩은 다수성인 ‘신팔달콩2호’(subgroup 4)를 모본으로 하고 ‘큰올콩’(subgroup 3)을 부본으로 하여 육성되었다. 이처럼 강원도 육성 콩 품종의 집단구조 변화 양상은 subgroup 1의 영역이 감소하면서 subgroup 3과 4의 영역이 증가하였다(Fig. 3). 이는 무상일수가 짧고 기상재해가 잦은 강원도 지역에 적응해 나가기 위해서 재래종의 성숙기를 앞당기고 내도복 특성을 지속적으로 개량해 왔기 때문이다. 이러한 강원도 콩 품종에서 admixture 증가 양상은 육종 역사가 비교적 오래된 장류 및 두부콩류에서 공통적으로 나타나는 현상으로 다양한 subgroup의 재래종 혹은 품종을 이용한 유전자조합(genetic reshuffling)을 지속적으로 유도한 결과일 것으로 판단된다(Sohn et al. 2017b). Fig. 4의 계통도에서 subgroup 2와 3을 각각의 그룹으로 명확하게 구분하였다. subgroup 1의 경우 다른 subgroup에 비해서 교배모부본이 더욱 다양하기 때문에 계통도에서 넓게 분포한다. Subgroup 1인 호반, 흑청, 청아는 각 품종을 조성하고 있는 subgroup의 비율에 차이가 있다(Fig. 3B). 특히 호반의 경우 subgroup 1과 3의 조합으로 이루어져 있어 계통도에서 subgroup 3과 좀 더 가깝게 위치하는 것으로 판단된다. 반면, Subgroup 4와 관련 admixture는 계통도에서 2개 그룹으로 나뉘었다(Fig. 4). 계보도 분석결과 subgroup 4는 ‘Williams’가 공통 조상으로 내재해성이면서 밀식 적응성이 우수한 다수확 품종을 포함한다(Fig. 5A). 특히, ‘신팔달2호’(덕유XSS79168)는 이러한 장점을 가진 대표적인 품종으로 ‘장기’, ‘신기’, ‘대풍’, ‘강일’, ‘햇살’, ‘청두1’, ‘검정5호’를 육성하는데 교배모부본으로 활용되었다. 두번째 그룹에는 ‘Williams 82’, ‘L29’. ‘팔달콩’ ‘다장’, ‘일미콩’, ‘푸른콩’, ‘녹채’ 품종이 있으며, 계보도에서 공통된 교배모부본을 가지고 있음을 확인할 수 있었다. 또한, 집단구조 분석 결과(Fig. 5B)는 사용된 202개 InDel이 교배모부본의 정보를 잘 반영하고 있으며 집단구조와 계통도가 잘 연계되어 있음을 잘 뒷받침하고 있다. Phylogenetic analysis among 153 soybean cultivars by using weighted neighbor-joining analysis in DARwin software. The horizontal bar indicates distance based on the simple matching coefficient. HC, Heugcheong; HB, Hoban; CA, Cheonga; GI, Gangil; DW, Daewang; HS, Haesal; GC, Gichan. For expanded details of 153 soybean cultivars, see Table 2. Relationships among the soybean cultivars by using pedigree analysis and structure analysis. Pedigree analysis (A) and structure result (B) of subgroup 4 among 153 soybean cultivars. SPD, Sinpaldal; SPD2, Sinpaldal 2; W82, Williams 82; PD, Paldal; GJ5, Geomjeong 5; JG, Janggi; CD1, Cheongdu 1; PR, Purun; DJ, Dajang; HS, Haesal; NC, Nokchae; DU, Deokyu; GI, Gangil; DP, Daepoong; SG, Singi; IM, Ilmi; CO, Chamol; HKS, Heuksung; JY, Jangyeop; EH, Eunhakong; GJ2, Geomjeong 2; CJ, Cheongja; BU, Backun; KO, Keunol. 이러한 비교분석이 가능한 것은 대두 육종 역사가 매우 짧아(~70년), 교배모부본에서 유래한 재조합블록의 리셔플링으로 새로운 품종이 육성되었기 때문이다. 이중 표준유전체(‘Williams 82’) 정보와 차이를 보이는 SNP 수가 10kb 당 4개 이상일 때 이를 dVB로 규정하였으며 동일한 선조의 게놈으로부터 유래한 dVB는 품종 간에 일치함을 확인하였다(Kim et al. 2014). dVB에서 73,327개 InDel를 탐색하였으며, 이중 202개를 선발하여 콩 품종인식시스템에 적용하여 사용자 편의성을 더욱 높였다(Sohn et al. 2017a). 이처럼 InDel을 이용하여 각 품종 고유의 dVB 유래가 모본 또는 부본인지를 정확히 탐색할 수 있어 효과적으로 품종 판별이 가능하며, 유전적으로 유사도가 높은 여교배 품종들 간의 구별이 더욱 쉬워졌음을 잘 나타내고 있다(Kim et al. 2014, Sohn et al. 2017a). 또한. 구축된 데이터베이스의 상호호환성은 소규모 기관의 재정 부담을 줄여주며, 기술적 접근성을 더욱 쉽게 하여 일반 실험실 수준에서 품종 식별이 가능하게 한다. 요컨대, 202개 InDel 마커에 기반한 콩 품종 인식 시스템을 이용하여 148개 국내 콩의 바코드 유전형과 명확히 구분되는 강원도 콩 품종의 바코드 데이터베이스를 구축하였다. 또한 강원도 육성 콩 품종의 집단구조 및 계통유연관계를 분석한 결과 다양한 소비 양상에 맞춰 다른 subgroup 간 유전자조합이 육종을 통해 지속적으로 유도되었음을 밝혔다. 향후 품종 인식 시스템의 도입으로 지역적응성이 우수하면서 유전구조가 다양한 유전자원을 손쉽게 탐색할 수 있어 품종 육성 효율을 높일 수 있을 것이다. 무엇보다 202개 InDel을 이용한 바코드 데이터베이스 구축으로 강원도 콩 품종의 지식재산권 보호 및 브랜드화로 강원도 콩 산업의 경쟁력을 제고할 수 있을 것으로 기대된다. 본 연구에서는 dVB 특이적인 202개 InDel 마커를 이용하여 강원도에서 육성된 콩 품종의 바코드 데이터베이스 구축 및 유전분석을 수행하였다. 강원도에서 육성된 품종의 202개 InDel의 다형성을 기존의 147 품종과 비교한 결과 강원도 품종이 명확하게 구분되었다. 이는 식량원에서 개발된 콩 품종 인식 시스템이 강원도 품종의 보급종 체계에서 품종의 균일성과 안정성 평가에 적용 가능함을 나타낸다. 153개 품종의 유전형을 이용하여 집단구조를 분석한 결과, ‘흑청’, ‘호반’, ‘청아’는 subgroup 1으로, ‘기찬’, ‘대왕’, ‘햇살’, ‘강일’은 admixture로 구분되었다. 강원도 재래종의 숙기를 앞당기 위하여 subgroup 3의 유전 영역이 도입되었으며, 강원도의 특이 환경 및 기후변화 대응에는 subgroup 4가 주로 이용되었음이 유전분석집단에서 확인되었다. 특히, 다양한 소비자의 욕구를 충족과 함께 지역 환경에 적응성을 높이기 위해서 신품종 육성에 유전구조가 다른 다양한 재래종(혹은 품종)의 유전 영역이 지속적으로 도입되어 admixture 집단이 증가한 것으로 판단된다. 결론적으로 강원도 품종의 바코드 데이터베이스 구축은 품종 식별 정확성과 효율성을 향상시켜 품종의 권리 보호와 함께 종자산업 경쟁력을 보다 높일 수 있을 것으로 기대된다. 향후 dVB에 연관된 양적/질적 형질에 대한 추가 연구와 함께 202개 InDel 마커를 이용하여 실험실 수준에서 교배모부본의 잠재적 가능성을 평가할 수 있기 때문에 품종 육성의 효율을 더욱 높일 수 있을 것이다. 본 논문은 농촌진흥청 국립식량과학원 시험연구사업(과제번호: PJ01125901)의 지원에 의해 이루어졌다. 2016년도 농촌진흥공무원 장기교육훈련[멘토: 김율호(국립식량과학원), 멘티: 송윤호(강원도농업기술원)] 과정 중에 도출한 결과를 활용하였다. Agarwal M, Shrivastava N, and Padh H. Advances in molecular marker techniques and their applications in plant sciences. Plant Cell Rep 2008;27:617-631. Choi JK, Ha KS, Byum HS, Heo NK, Jang EH, Kim SS, Lee SJ, and Sa JG. A new soybean cultivar &apos;Daewang&apos;with high quality and large seed size. Korean J Breed Sci 2011;43:177-179. Deschamps S, and Campbell MA. Utilization of next- generation sequencing platforms in plant genomics and genetic variant discovery. Mol Breed 2010;25:553-570. Ganal MW, Altman T, and Röder MS. SNP identification in crop plants. Curr Opin Plant Biol 2009;12:211-217. Evanno G, Regnaut S, and Goudet J. Detecting the number of clusters of individuals using the software STRUCTURE: a simulation study. Mol Ecol 2005;14:2611-2620. Ha KS, Heo NK, and Han TJ. A green seed soybean variety &apos;Heugcheongkong&apos;with black seed. Korean J Breed Sci 2002;34:80-81. Ha KS, Choi JK, Heo NK, Kim SS, Lee AS, Jang JS, and Yun HT. A new tofu and soy-paste soybean cultivar &apos;Hoban&apos;with large seed and high yield. Korean J Breed Sci 2013a;45:158-162. Ha KS, Choi JK, Cho SH, Byun HS, Kim SW, Jang JS, Yun HT, Moon JK, Kim SJ, and Park KY. A new and soy-paste soybean cultivar, &apos;Cheonga&apos;with disease resistance, lodging tolerance and high yield. Korean J Breed Sci 2013b;45:452-456. Hou XH, Li LC, Peng ZY, Wei BY, Tang SJ, Ding MY, Liu JJ, Zhang FX, Zhao YD, Gu HY, and Qu LJ. A platform of high-density INDEL/CAPS markers for map- based cloning in Arabidopsis. Plant J 2010;63:880-888. Hwang TY, Sayama T, Takahashi M, Takada Y, Nakamoto Y, Funatsuki H, Hisano H, Sasamoto S, Sato S, Tabata S, Kono I, Hoshi M, Hanawa M, Yano C, Xia Z, Harada K, Kitamura K, and Ishimoto M. High-density integrated linkage map based on SSR markers in soybean. DNA Res 2009;16:213-225. Hyten DL, Song Q, Fickus EW, Quigley CV, Lim JS, Choi IY, Hwang EY, Pastor-Corrales M, and Cregan PB. High- throughput SNP discovery and assay development in common bean. BMC Genomics 2010;11:475. Inger H, and Rodomiro O. In situ and ex situ assessment of morphological and fruit variation in Scandinavian sweet cherry. Sci Hortic 2000;85:37-39. Kim MY, Lee S, Van K, Kim TH, Jeong SC, Chio IY, Kim DS, Lee YS, Park D, Ma J, Kim WY, Kim BC, Park S, Lee KA, Kim DH, Kim KH, Shin JH, Jang YE, Kim KD, Liu WX, Chaisan T, Kang YT, Lee YH, Kim KH, Moon JK, Schmutz J, Jackson SA, Bhak J, and Lee SH. Whole-genome sequencing and intensive analysis of the undomesticated soybean (Glycine soja Sieb. and Zucc.) genome. Proc Natl Acad Sci USA 2010;107:22032-22037. Kim S, and Misra A. SNP genotyping: technologies and biomedical applications. Annul Rev Biomed Eng 2007;9:289-320. Kim YH, Hwang TY, Seo MJ, Lee SK, Park HM, Jeong KH, Lee YY, Kim SL, Yun HT, Lee JE, Kim DW, Jung GH, Kwon YU, and Kim HS. 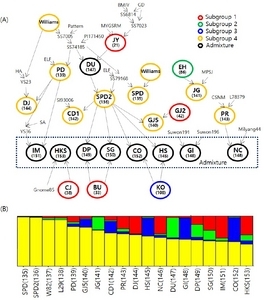 Discrimination of 110 Korean soybean cultivars by sequence tagged sites (STS)- CAPS markers. Korean J Breed Sci 2012;44:258-272. Kim YH, Park HM, Hwang TY, Lee SK, Choi MS, Jho S, Hwang S, Kim HM, Lee D, Kim BC, Hong CP, Cho YS, Kim H, Jeong KH, Seo MJ, Yun HT, Kim SL, Kwon YU, Kim WH, Chun HK, Lim SJ, Shin YA, Choi IK, Kim YS, Yoon HS, Lee SH, and Lee S. Variation block-based genomics method for crop plants. BMC Genomics 2014;15:477. Kim SH, Jung JW, Moon JK, Woo SH, Cho YG, Jong SK, and Kim HS. Genetic diversity and relationship by SSR markers of Korean soybean cultivars. Korean J Crop Sci 2006;51:248-258. Korir NK, Han J, Shangguan L, Wang C, Kayesh E, Zhang Y, and Fang J. Plant variety and cultivar identification: advances and prospects. Critical Rev in Biotech 2013;33:111-125. Lee C, Choi MS, Kim HT, Yun HT, Lee B, Chung YS, Kim RW, and Choi HK. Soybean [Glycine max(L.) Merrill]: Importance as a crop and pedigree reconstruction of Korean varieties. Plant Breed Biotech 2015;3:179-196. Lee YG, Jeong N, Kim JH, Lee K, Kim KH, Pirani A, Ha BG, Kang ST, Park BS, Moon JK, Kim N, and Jeong SC. Development, validation and genetic analysis of a large soybean SNP genotyping array. The Plant J 2015;81:625-636. Liu B, Wang Y, Zhai W, Deng J, Wang H, Cui Y, Cheng F, Wang X, and Wu J. Development of INDEL markers for Brassica rapa based on whole-genome re-sequencing. Theor Appl Genet 2012;126:231-239. Li Y, Liu B, Relif JC, Liu Y, Li H, Chang R, and Qiu L. Development of insertion and deletion markers based on biparental resequencing for fine mapping seed weight in soybean. The Plant Genome 2014;7:1-8. Moghaddam SM, Song Q, Mamidi S, Schmutz J, Lee R, Cregan P, Osomo JM, and McClean PE. Developing market class specific InDel markers from next generation sequence data in Phaseolus vulgarisL. Front Plant Sci 2014;5:295-300. 1000 Genomes Project Consortium. The origin, evolution, and functional impact of short insertion-deletion variants identified in 179 human genomes. Genome Res 2013;23:749-761. Mullaney JM, Mills RE, Pittard WS, and Se D. Small insertions and deletions (INDELs) in human genomes. Hum Mol Genet 2010;19:131-136. Pacurar DI, Pacurar ML, Street N, Bussell JD, Pop TI, Gutierrez L, and Bellini C. A collection of INDEL markers for map-based cloning in seven Arabidopsis accessions. J Exp Bot 2012;63:2491-2501. Pritchard JK, Stephens M, Rosenberg NA, and Donnelly P. Association mapping in structured populations. Am J Hum Genet 2000;67:170-181. Reyes-Valdés MH, Santacruz-Varela A, Martinez O, Simpson J, Hayano-Kanashiro C, and Cortés-Romero C. Analysis and optimization of bulk DNA sampling with binary scoring for germplasm characterization. PLOS ONE 2013;8:e79936. Rogers SO, and Bendich AJ. Extraction of total cellular DNA from plants, algae and fungi, pp. 1-8. Plant Molecular Biology Manual, Gelvin SB, and Schilperoort RA. Dordrecht: Kluwer Academic Publishers; 1994. Sham P, Bader JS, Craig I, Donovan M, and Owen M. DNA pooling: a tool for large-scale association studies. Nat Rev Genet 2002;3:862-871. Sohn HB, Kim SJ, Hwang TY, Park HM, Lee YY, Markkandan K, Lee D, Lee S, Hong SY, Song YH, Koo BC, and Kim YH. 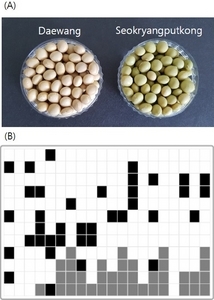 Barcode system for genetic identification of soybean [Glycine max(L.) Merrill] cultivars using InDel markers specific to dense variation blocks. Front Plant Sci 2017a;8:520. Sohn HB, Kim SJ, Hwang TY, Park HM, Lee YY, Koo BC, and Kim YH. Chromosome reshuffling patterns of Korean soybean cultivars using genome-wide 202 InDel markers. Korean J Breed Sci 2017b;49:213-223. Song Q, Jia G, Zhu Y, Grant D, Nelson RT, Hwang EY, Hyten DL, and Cregan PB. Abundance of SSR motifs and development of candidate polymorphic SSR markers (BARCSOYSSR_1.0) in soybean. Crop Sci 2010;50:1950-1960. Song X, Wei H, Cheng W, Yang S, Zhao Y, Li X, Luo D, Zhang H, and Feng X. Development of INDEL markers for genetic mapping based on whole genome resequencing in soybean. G3 (Bethesda) 2015;5:2793-2799. Yamaki S, Ohyanagi H, Yamasaki M, Eiguchi M, Miyabayashi T, Kubo T, Kurata N, and Nonomura KI. Development of INDEL markers to discriminate all genome types rapidly in the genus Oryza. Breed Sci 2013;63:246-254.